With her magnifying glass and fingerprint powder in hand, Nancy Drew leaves River Heights for La-La-Land...but not to meet that guy on Smallville, as her boyfriend Ned fears. No, she's out to solve one of the greatest mysteries ever: the death of movie star Dehlia Draycott. But the bigger mystery is how our perky, plaid-clad sleuth will fit in with the text-messaging teen queens of mean she meets at Hollywood High. Download Nancy Drew in Digital HD from the iTunes store. Nancy Drew images are © Warner Bros.. All Rights Reserved. Nancy Drew, the heroine detective of the widely popular mystery series, was reincarnated again during the summer of 2007, and now on DVD this March, with a little help from Warner Bros and director Andrew Flemming (The Craft). This time around, Nancy Drew played by the talented Emma Roberts, is a young girl detective from River Heights who must now leave the comforts of her small town and friend Ned Nickerson (Max Thieriot) to head to the big city of Los Angeles with her dad Carson Drew (Tate Donovan) for a business trip. As usual a mystery finds Nancy when she discovers that the Hollywood starlet that owned her house died of mysterious circumstances. Nancy finds herself sleuthing in the new town despite her dad's request to the contrary. Along the way she receives help from her new friends, Corkey (Josh Flitter) and valley girls, Inga and Trish (by Daniella Monet and Kelly Vitz). As the DVD first starts, we find Nancy Drew finishing up a case in her hometown. Right from the start, the audience falls in love with Ms. Drew. From her great personality to her quick witted detective skills, we know we are going to enjoy following her through her adventures. Emma Roberts is a perfect choice for Nancy Drew. She has the charm and personality to bring this iconic character from American culture into the new millennium and not make it feel dated. The supporting cast helps to bring the story to life with some great humor and chemistry. By the end of the DVD, the audience will feel the movie was over too quickly, and can only hope Nancy Drew will return to solve another mystery. Thankfully, Emma Roberts has signed on already for the sequel. 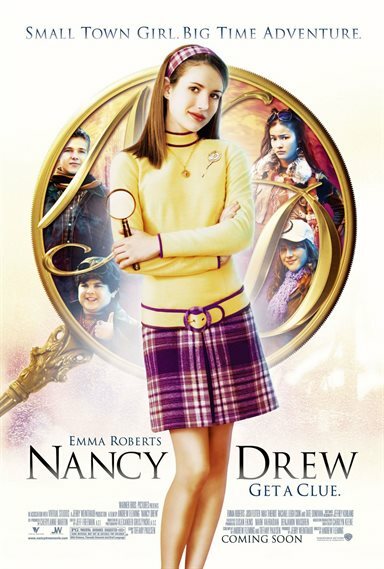 The Nancy Drew DVD, coming out March 11, 2008, contains both the amaphoric widescreen and full-screen versions of the film with Dolby Digital sound. The DVD itself is full of wonderful extras the entire family of sleuths would enjoy. First, in the special features, is a behind-the-scenes look at Nancy Drew with all the cast appearing as well as Director Andrew Flemming. These eight-minutes give great insight into the bond the cast shared throughout the entire shoot. Next up is a gag reel that shows it isn't always just work being done on the set of a major motion picture and in addition a music video for Pretty Much Amazing by Joanna which appears on the movie's soundtrack. Last but not least, the DVD features a Sleuthing section for the ones who want "TO BE" Nancy drew, including the kind of music Emma Roberts has on her iPod, her sleuthing kit, and what it is like (from her point of view) to be on the set of Nancy Drew. All in all this re-creation of the timeless classic, Nancy Drew, is a wonderful DVD the entire family can enjoy, have a few laughs, a few frights, and of course of enjoying solving the mystery right along with Nancy. P.S. 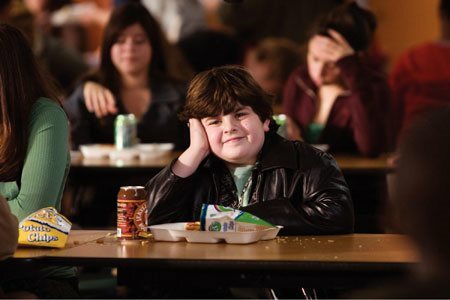 Be sure to be on the look for a cameo by a certain star of another film that was out the summer of 2007. Nancy Drew images © Warner Bros.. All Rights Reserved.